The Face Machine automatically installs a high-level facial setup and does intelligent point weighting. The Face Machine is Anzovin Studio's auto-rigging tool for Maya, but instead of rigging bodies, it rigs faces! Like The Setup Machine, The Face Machine (or TFM) automatically installs a high-level facial setup and does intelligent point weighting. TFM supports both box controls and direct controls that allow the animator to simply grab the face and deform it into the exact expression desired. Since it's based on direct deformation, rather then a set of pre-defined blend shapes, TFM rigs can produce any expression you can imagine with unparalleled ease. The Face Machine makes rigging a face fast and easy. The Face Machine Nodes allow anyone, without the purchase of TFM, to animate faces rigged with The Face Machine. The Face Machine Nodes are free to download here. Like The Setup Machine, The Face Machine uses a simple “face widget” to rig your character. Just fit it to your mesh and hit rig! TFM’s intelligent weighting technology is capable of automatically recognizing the difference between an upper lip and a lower lip on most faces, cutting down manual weight cleanup time to a fraction of what’s needed for other influence-based face rigs. A special schematic window, embedded in each TFM character, allows you to select facial controls with unparalleled ease. Just grab your character’s face controls and start posing! 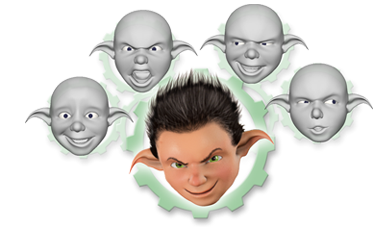 The Face Machine eliminates clumsy blend shape sliders and puts you in control of your character’s expressions. With its simple box control creation interface, TFM makes multidimensional sliders a snap to create. TFM allows you to easily save a pose into the characters very own personal facial pose library, either locally for your own use or on a server for use by a team of animators. The library interface comes complete with thumbnails for easy pose referencing. The Face Machine's rig gives you control over fine-tuning every aspect of your character's face. Auto deformation values can be easily adjusted to allow for even MORE detailed control of your poses.